Friday, April 24th we arrived in Athens at 6:00 in the morning, travel weary and anticipating our bed. It was a rainy day in Greece when we arrived and I must say, I was slightly disappointed. We found out later that day that the weather was unusual, and it cleared up within a day. Thank-goodness! The next day the weather was back to it’s Mediterranean self, and we were able to start enjoying Athens. A friend of mine commented that he wasn’t a fan of Athens, and found it to be a dirty city. And maybe that’s how you could see it if you came straight from Vancouver to Athens. But if you want to be wowed, spend some time in Egypt before you go. Then Athens will seem like Heaven. He was right in that Athens is not the cleanest city. That being said though, there is a lot of charm in the oler part of the city. 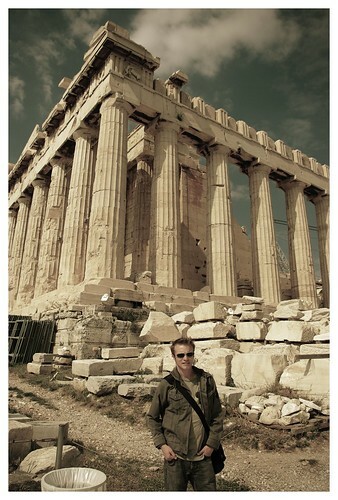 We spent most of our time wandering around the Acropolis (where the Parthenon is), & Ancient Agora. I appreciated how they made all the archeological sites into big parks that you could spent the whole day at. (Egyptian sites were hectic and you couldn’t spent a day just relaxing at the Pyramids. Impossible). One of our favorite spots was a little street of cafes that had a great view of the Acropolis. That same area also has a really great market area that has a lot of cute dresses and jewelry. One thing that was a breath of fresh air for us was being in a culture that was closer to our own. No where along the way did we have people hassling us to buy things, or honking at us, or trying desperately to please us. We also could go where we wanted without a guide constantly at our side. It was nice to feel a little bit of freedom again. Tomorrow we head out to Crete, one of the Greek islands. It’s famous for it’s Minoan archeological sites, which Dave and I are both particularly excited to see. This entry was posted on Thursday, April 30th, 2009 at 1:27 amand is filed under Greece. You can follow any responses to this entry through the RSS 2.0 feed. You can leave a response, or trackback from your own site.